Master Constantin Brancusi sure had a way with words every time he meant to explain his obstinate passion for his unadulterated shapes, which exposed what he liked to call the “truth to materials” or the living qualities of matter. How could he possibly have been a fan of a technique implying a stylized and accurate imitation of nature, since everything surrounding him as a child (the spindle, the low, round peasant table, the fence planks) consisted of simplified geometric shapes? I believe the answer lies neither at the Pompidou Centre, nor at the MoMA, but back at his home, in North Oltenia. Things haven’t changed much in the small village of Hobita, the sculptor’s birthplace, where houses just like Brancusi’s old cottage are still built on a high stone foundation, with porch pillars and window frames thoroughly carved, displaying primitive symbols and symmetrical patterns. That adds to the simple lifestyle. After having spent merely an hour in Hobita, I could easily recognise the raw influence his native village had on his creation, on his self-awareness as a valuable artist and on his stubbornness to travel by foot all the way to Paris, just to achieve his ambition. On one of the many occasions he returned home, he was commissioned to create a homage to the Romanian heroes who fought in the First World War. The public gardens of Targu Jiu were chosen to host an open air exhibition for those intrigued by another of his aphorisms: “my work is even for the sightless.” “The Gate of the Kiss” (in picture), “The Chairs Alley”, “The Table of Silence” and “The Endless Column” (in picture), all had different stories of what the sculptor really meant, but they were intentionally left within one’s grasp. Hence, I could run my fingers over the golden cast-iron modules, as they stood there, warm under the hot sun, even though I couldn’t encompass the column’s endlessness with my gaze. 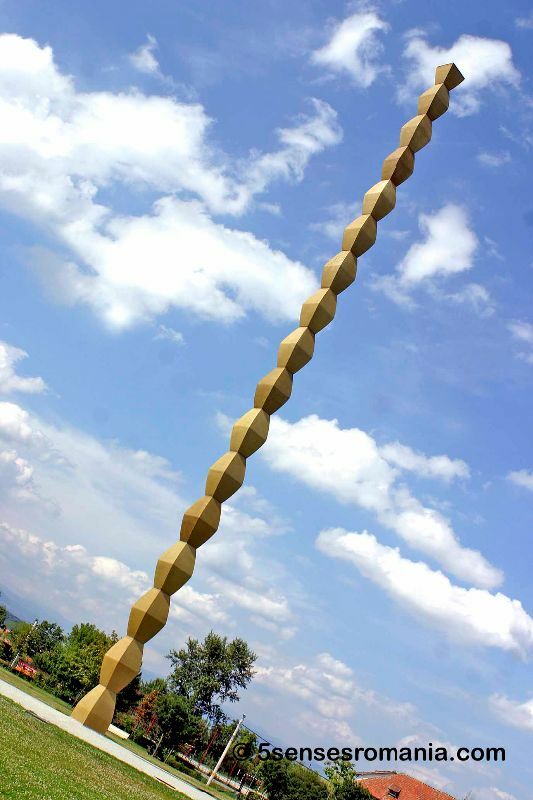 A trip to Targu Jiu and Hobita is quite meaningless without exploring the core inspiration of Brancusi’s art: the mountain landscape. Imagine that he grew up at the foot of the Southern Carpathians, in an area that to the present day cherishes the last unaltered old-growth forests in Europe, such as those found in the Domogled-Cerna River Valley National Park. These wooden giants seem to have taught the lean, vigorous, dark-haired and black-eyed people the art of woodcarving. I continued my sensory quest for the “idea” by means of mountain climbing in the Retezat Massif. 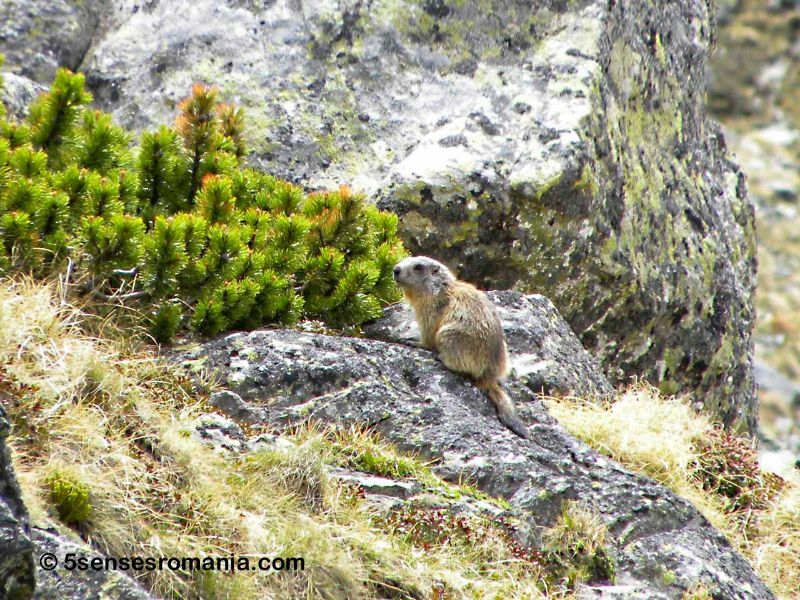 The group I was joining hiked through the thick forest up to Lake Bucura, the largest crystal clear glacier lake in Romania, and a couple of hours later we were already thrilled at the sight of some baby chamois and a few lively marmots. Needless to say, we experienced all four seasons while crossing the glacier. 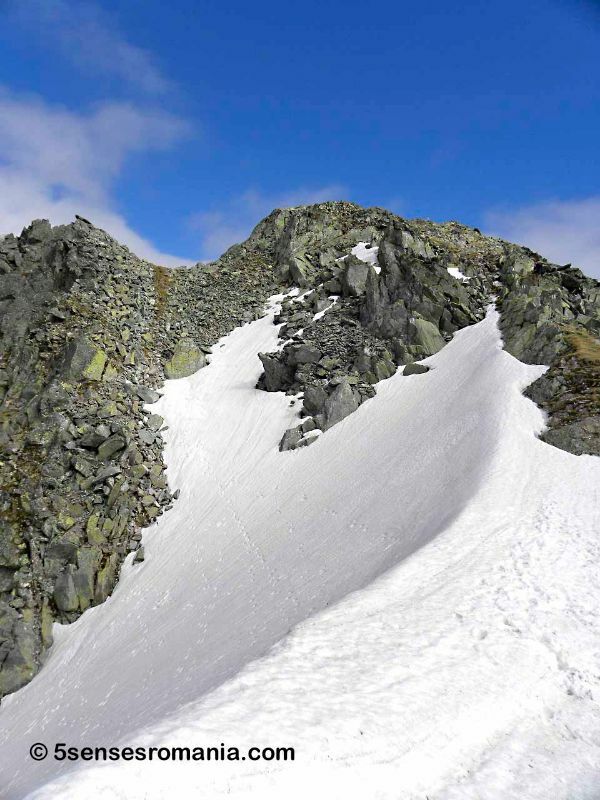 I got my hopes up and there I was, at 2,509 m (8,232 ft) in the perfect sunny day, with scattered clouds below my feet. I stood in complete silence, holding my bruised palms and staring at half of North Oltenia and South Transylvania, when I realized what Brancusi meant by “the essence of things”. The mountain was a living and unspoiled work of art. Every rock that I grasped and climbed, the throbbing pain in muscles I never knew I had, the adrenaline rush while crossing the narrow mountain ridge with snow slipping under my feet, freezing wind and sun burns in May, it all made a pretty good lesson about Brancusi’s wild artistic vision. Once we returned to the Mountain Rescue shelter, one girl from our group kept walking, being afraid that if she had stopped for a while she would have found it impossible to continue with the descent. Luckily, we met some hikers from Baia Mare and they offered us a sip of palinca and honey, the magic trick that got us descending the remaining 500 m (1,640 ft) to the point we left our car. I myself am petite, but when we reached the guesthouse for dinner, I had three large schnitzels with some red wine, then a tablet of Paracetamol and rubbed a bit of ointment on the blisters before getting the best night’s sleep in years. The locals have a saying about Retezat: “hard to get, hard to forget”; I loved it every minute, so this must be true. As a matter of fact, two days later we were unexpectedly hanging around with a bear in one of Retezat’s last virgin forests, but this is a story for another time. The easiest way to get to the area is by taking the A1 Highway from Bucharest to Pitesti, 7 National Road (DN7) Pitesti to Ramnicu Vilcea, then DN67 from Ramnicu Vilcea to Targu Jiu. Hobita is only a half-hour drive from Targu Jiu on DN67D. To reach the National Parks, take DN66A and DN66. We tested the roads ourselves and they are in good condition. Traveling by train is also a convenient option. 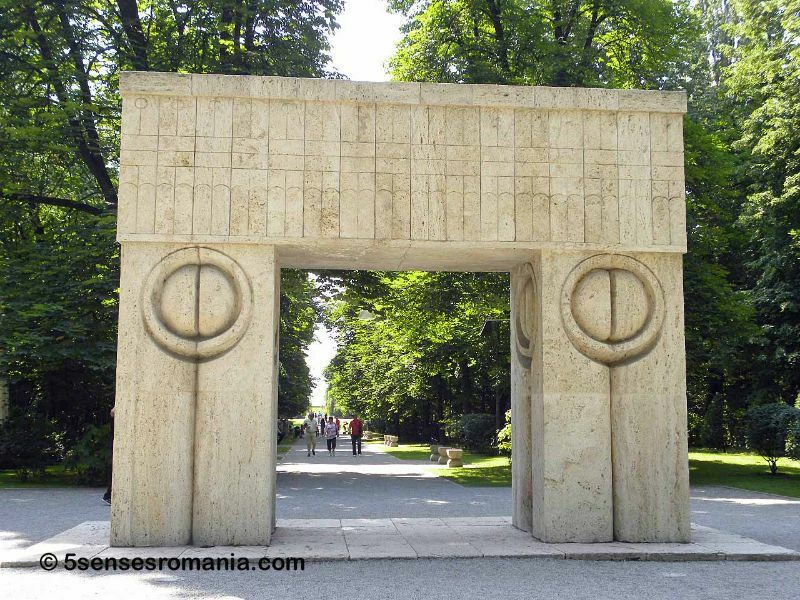 Brancusi Sculptural Ensemble in Targu Jiu is part of the public gardens in the city center – free access, always open; however, there is an admission fee at the Constantin Brancusi Memorial House in Hobita and it would be best if you planned your visit ahead. Hiking and trekking in any of the National Parks (Retezat or Domogled-Cerna) is usually at tourists’ own convenience, but I highly recommend hiring a local ranger, not only for the extra safety, but also for the firsthand information. Retezat National Park charges a small admission fee; camping is allowed near Lake Bucura, but open fire/bonfire, as well as bathing/washing in the lake is strictly forbidden. In each location good value accommodation is available.